Quilting has a fascinating history in the United States. Quilt designs and techniques vary across time periods, ethnic groups, and regions of the country. Each style of quilting tells a story about the daily lives of the people who made them. Quilting is one instance of the intersection between art and craft. Though the root of quilting in the United States is anchored in the necessities of colonial, pre-industrial domestic living, it quickly evolved into an independent art form. On display are locally made quilts, which provide stories about the people who made them and the time period they lived in, of particular interest is the rarely exhibited Grant quilt. Before he became a Civil War hero and the 18th president of the United States, Ulysses S. Grant served as a young captain at Fort Humboldt in Eureka from 1853 to 1854. 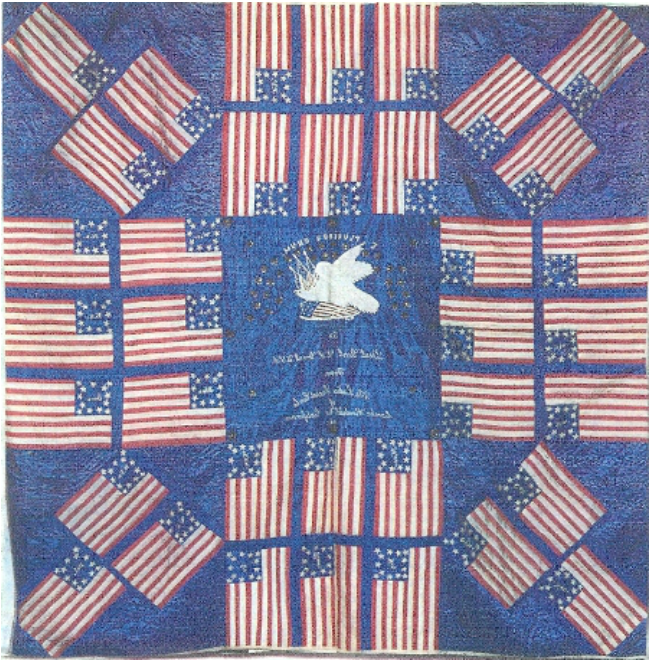 In 1865, to honor the famous former resident, members of the Ladies Social Circle of Eureka made a patriotic-themed quilt, which they auctioned off to raise money for wounded veterans. Hand-stitched of red, white and blue silk, the quilt displays an American flag for every state in the then-reunited union. A center medallion of gold thread shows an eagle and the quilt’s dedication to the Civil War victorious Gen. Ulysses S. Grant. After the funds were raised, the “Grant-Banner Quilt” was sent to Grant along with a letter, and this brought a thank-you note from Grant himself. In 1991, the Grant family returned the quilt to Humboldt County, entrusting it to the Clarke Historical Museum in Eureka. On exhibit through early September, the public will have the opportunity to see the “Grant Quilt,” along with other historical Humboldt County quilts from the Clarke Museum’s collection, which are also on display at the museum.